As I mentioned in a prior blog, MCR played two intimate shows at The Roxy in Los Angeles this past weekend. 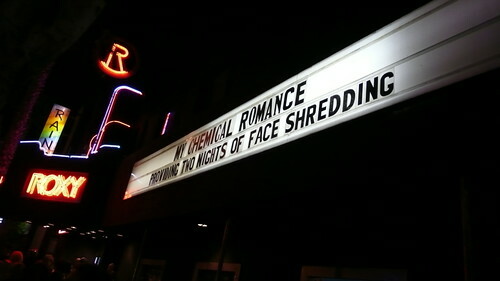 Fans were treated to "two nights of face-shredding" as the marquee reads. Lucky fans who were either invited to the show personally or who won tickets from KROQ got to witness the band's first performance since their hiatus along with the debut of three new songs from the upcoming MCR album. "Kiss the Ring / LA Heavy"
The upbeat, swing-esque vibe of the new songs is reminiscent of past songs such as: "House of Wolves", "Headfirst for Halos", and "You Know What they Do to Guys Like Us in Prison". I can almost guarantee that, over the upbeat music, bleak lyrics are being sung as is signature for My Chemical Romance. Afterall, Gerard did describe "Death Before Disco" as "an anti-party song that you can party to." Get stoked, kids. Exciting things are starting to happen in the world of MCR and they will grow only more exciting from here. To view more photos from the show and to learn more, check out The Roxy Blog's flickr, and check out the entry posted on The Roxy's website. I was admittedly thrown-off by them at first, but I have heard only good things from the people I have talked to who have heard the recorded versions. Nothing sounds quite so great on a bootleg. Here's to hoping you like them better when you can get the full effect of them from a recording.